We all know what an impact mistakes can have in a game of football, but I don’t think anyone thought it would have this much say on the score line. Indeed, as Cameroon were looking quite comfortable with the score at 1-1 as they looked for another goal, Aurelien Chedjou’s terrible pass fell to the feet of Raul Meireles in front of goal, he ended up sending his team into freefall. Setting up with three up front in a 4-3-3 formation as hoped in Leiria, the first half saw Cameroon put in a very impressive performance, as they equaled Portugal’s every move and more. Keeping the ball well throughout, Vincent Aboubakar acted as an excellent central figure point for the attacks to revolve around, as the midfield’s preference to loft the ball into him evident from the start. Despite going behind to a goal that was reasonably difficult to prevent – such are so often the goals of Cristiano Ronaldo – the response of the Indomitable Lions was impressive. Nyom and Assou-Ekotto made even more runs up the field than previously as they continued to aim for Aboubakar, whilst Choupo-Moting caused the Portuguese defence some trouble with his tricky dribbling. The goal eventually came though, as Aboubakar controlled the ball on his chest before turning the defender and finishing into the back of the net. And it was certainly deserved, as the team had the better of the game up until that point, with Alex Song recycling the ball nicely from the centre of the pitch to build attacks, whilst the full backs ran up and down the pitch like a chair lift up a mountain. The second half started in similar vein, as Cameroon continued to push for another, with Choupo-Moting cutting in from the right nicely and going close. But then it all went wrong. After the substitute goalkeeper Guy Roland Ndy Assembe – brought on at half time to replace Charles Itandje – had made some excellent saves, Chedjou’s lazy pass into Meireles signalled a flood of goals. 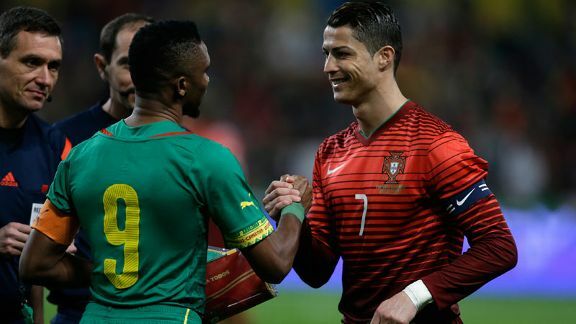 With Coentrao scoring almost seconds after Meireles, goals from Edinho and finally Ronaldo made the difference against a deflated Cameroon defence, to create a scoreline that certainly was not representative of the scoreline. But there are positives to be taken I believe. Allan Nyom – the best player in a green shirt in my book – had a belter of a game from right-back. A real headache for the full backs on the overlap in the attacking end, he also dealt wonderfully with an in-the-mood Ronaldo in defence, as he really made his claim to replace Stephane Mbia in the position – who had played there in the playoffs against Tunisia. Vincent Aboubakar too was excellent, continuing the superb form he’s shown for Lorient this year, as he was another one who took advantage of an injury to stake his claim – coming in for Pierre Webo. The keeping of the ball too was another important point to take from the game, as they held onto it far better than I had previously seen in other games, with Alex Song particularly impressing. As for the negatives, the obvious drop-off in performance was not acceptable. You got the sense of how weak the team can be mentally by this, as they really did not live up to their Indomitable Lions nickname. It almost became like playground football at the end – as players pretty much couldn’t be bothered to track back to defend. As well as this, the lack of final ball was a bit of a problem. Whilst good leading up to the box, not many clear-cut opportunities highlighted the lack of obvious creative force in the middle of the park for Cameroon. But overall I was surprisingly impressed. It did get a bit embarrassing at the end, but Finke’s willingness to go at the big teams and not be scared is something that is good to know ahead of the World Cup, as it looks like the dreaded 4-4-2 with four defensive midfielders is on the way out. It also showed that Samuel Eto’o – who was invisible for the most part – does not need to be on form for Cameroon to fire.